A beautiful Sunday afternoon inspires in many of us one thought: Get out the barbecue grill! Yes, even vegans like to cook outside on the grill from time to time, and I especially like it because my daughter will eat any vegetable (except pepper) if it’s cooked on a skewer. Yesterday’s decision to grill was made at the last minute, so I had to make do with what was in the house. I started some tofu marinating in our favorite teriyaki grilling sauce, put on a pot of brown jasmine rice, cut some summer squash and bell peppers into chunks, and threw together an Asian-inspired, grilled fruit dessert. It was simple and light but so good! Mix the sauce ingredients together. Use half to marinate the tofu, and reserve the rest to use during grilling and to add at the table. The best way to marinate the tofu is to put it in a plastic zip-lock bag with the marinade. Turn the bag often so that all parts of the tofu get marinated. Let the tofu sit in the marinade for at least 1 hour. While the tofu is marinating, soak some bamboo skewers (about 12) in water. 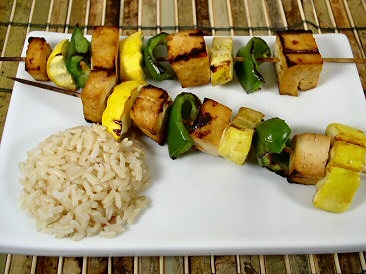 When the tofu is ready, thread it onto the skewers, alternating with squash and pepper. Place the kabobs in a large baking dish and pour the tofu marinade over them. When the fire is ready, place the kabobs on the grill and cook, brushing with some of the reserved teriyaki sauce and turning so that each side is lightly browned. Serve with rice and drizzle with extra sauce at the table. 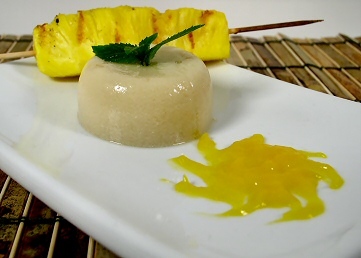 Dessert was a fairly simple but fancy-looking Almond Jelly with Grilled Pineapple and Mango Puree. I will leave you with a photo; click for the recipe. Previous Post: « Hasty Tasty Pasta with Broccoli, Olives, and "Chicken"
Just finished assembling my kabobs. I can't stop licking my fingers because this marinade is so good! I plan to use it in the future for stir-frys and baked tofu. Thanks so much! Made this tonight and it was fantastic!! I think I could have drank the marinade it was so good. Thanks for the great recipes!